In a lot of ways I’m ready for fall, but I want nothing to do with apples and pears quite yet…I’m still clinging for dear life onto the summer fruit and veg. Just this morning I went to the Union Square Greenmarket to restock my supply of peaches, raspberries and tristar strawberries, afraid that maybe by next week they’ll have disappeared. I find some consolation in the fact that, if I cook my fruit down with a little sugar and lemon juice, I can trap a piece of summer in a Mason jar and keep it for a few more weeks. Note: To prep your stonefruit, wash (and peel the nectarines…for the plums, you can leave the skins on), halve and pit them. Then slice them very thin. You want to wind up with 1 pound of fruit after prepping. The jam will continue to thicken as it cools, so err on the side of undercooking. Because of its reduced sugar amounts, this jam cannot be canned. – Set a bowl over a larger bowl of ice water; set aside. – In 10- or 12-inch skillet, bring fruit, sugar, and lemon juice to boil over medium-high heat, stirring occasionally. Reduce heat to medium and cook, stirring constantly and skimming foam as necessary, until mixture begins to look syrupy and thickens slightly, about 5 minutes; remove from heat. Spoon 1/2 teaspoon fruit mixture into bowl over ice water; allow to set for 30 seconds. Tip bowl 45 degrees to one side; jam should be a soft gel that moves slightly. If mixture is liquid and runs to side of bowl, return skillet to heat and cook, stirring constantly, 1 to 2 minutes longer; then repeat test. Save the ice bath to cool the finished product. 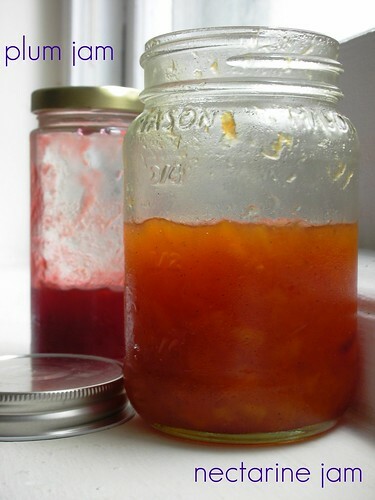 -Cool jam to room temperature (over the ice bath) before serving or transferring to a clean glass jar or airtight container (you can sterilize first with boiling water, if you are so inclined). It will keep, covered and refrigerated, for up to two weeks (I’ve kept mine for up to a month…but that’s just me). This is a great idea for trapping summer in a jar! Wow…. these look fabulous! Perfect for shortbreads/tarts, etc! I wonder if I could use the same technique for strawberries??? Hm…. love the photograph!! mike– you can…follow the link, cuz it gives the specifics for strawberries as well (just uses a diff amount of sugar, i think). Do you ever make blueberry jam? I should make jams more often. Homemade is the best! This plum jam was awesome. Also awesome was the miniature plum cobbler we made with our leftover fruit. Go plums! What a terrific way to capture summer! These look so delicious!!! I want to grab and spoon and just reach into the computer! Since I can’t canned this, can I put them in the freezer? I think so. Also, they will really last about a month in the refrigerator, if you can use them up in that time.